Creating Joy, Happiness and Health in Our Daily Lives! Let’s fill ourselves up with the routines of daily living and bring back the joy of simple pleasures, spending time in the garden, slicing and dicing vegetables, listening to the birds sing their song of summer and learn a few tricks to better health. Start each day with yoga outside on the deck, a salute to the morning sun. Work along Chef Kären Jurgensen and apply special techniques to spice up meals that feature local, seasonal, organic products fresh from the farm. Ferment your own delicious tonics and probiotics. Learn about herbal remedies, teas, and balms, many which are growing in the garden or in the wild spaces that surround Quillisascut. Share delicious meals with new friends at the farmhouse table. 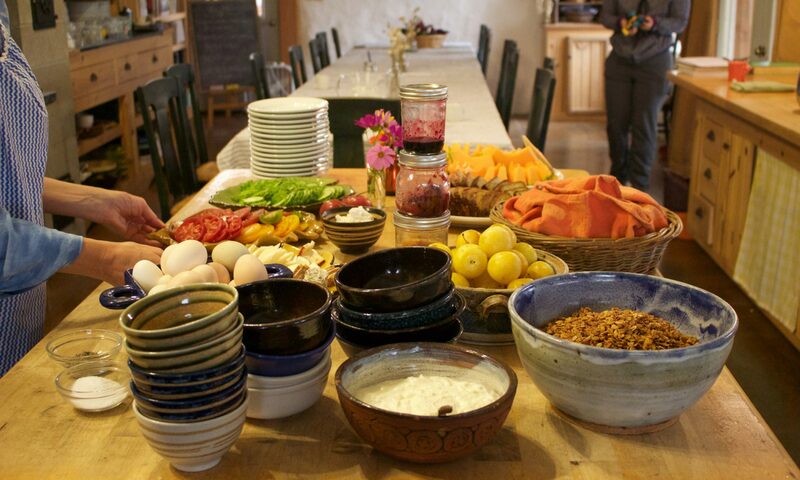 Chef Kären Jurgensen has been the culinary instructor at Quillisascut Farm for ten summers. She inspires us with ingredient driven recipes fresh from the garden and a passion for including wild foods in the menu. She is currently a chef instructor at Seattle Culinary Academy. Lynn Christensen from Artemisia Acupuncture will speak on Chinese nutrition and the different properties of food (cooling, heating, damp draining etc.). She will also explain what to expect when you consult with an acupuncturist and how they can assist you and your body in maintaining harmony and good health. Ann Harmon from Morning Myst Botanics Distiller of organic hydrosols, oils and fine herbals, will set-up a small distiller to produce a hydrosol for us to use in a lotion or potion. This workshop is about creating balance, nurturing a sense of health and remembering to laugh out loud.